Home|Floral Library|Banksia – Banksia spp. Decorative Life: About 2 plus weeks. Harvest when 10-30% of the basal florets are open is one recommendation while another states 5-10% open. Store at 32-38 degrees although some recommend higher temperatures with little supporting data. Storage for a maxium of 2 weeks for most cultivars and species. Named after Sir Joseph Banks (1743-1820), botanist and patron of science. Species are classified by form (cup or bottle-brush) and size (small, medium, large). Part of about 50 species of evergreen shrubs and trees. Flowers of many species that look like Protea are called Protea even though they might be a different species. Suitable for drying. Leaves can tun black due to low light and especially due to lack of carbohydrate. Therefore, make sure a fresh flower food containing sugar is used. Propagated by cutting and with difficulty from seeds. Faragher et al. (2000) reported that B. prionotes stored well for 4 weeks at 32-34F only if sealed in plastic bags. According to Ben Gill, Banksia leaves usually will not turn black at any stage. They will just dry up to a brown or muted green color. 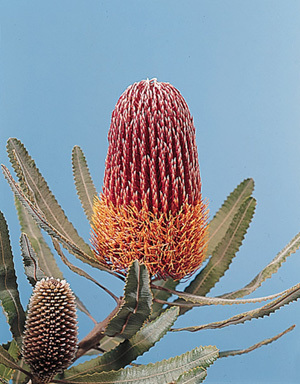 He also states that Banksia Menziesii (photograph) is usually easier to propagate from seed rather than cuttings. Seeds can be collected from heads left on the bush form previous year.